Just released, the Dutch version of the ESNO Nurses Biosimilar guide. Great news for Nurses in the Netherlands. 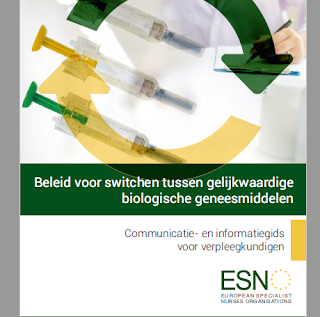 The Nurses Information and Communication Guide on Biosimilars in Dutch'Beleid voor switchen tussen gelijkwaardige biologische geneesmiddelen'Communicatie- en informatiegids voor verpleegkundigen. 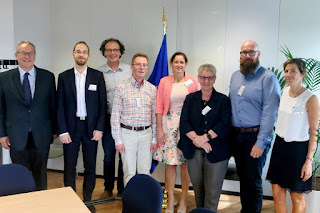 De volledige gids is to downloaden onder deze LINK De ESNO is opgericht om een effectief kader te bieden voor communicatie en samenwerking tussen de Europese organisaties van gespecialiseerde verpleegkundigen, en om de belangen van gespecialiseerde verpleegkundigen in Europa te bevorderen en vertegenwoordigen. 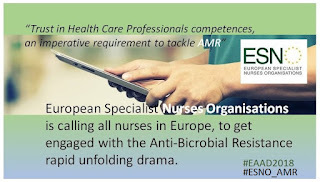 Special announcement on ECDC Survey January 2019 on Antimicrobial Resistance with key role for Specialist Nurses. “The Specialist Nurse in European Healthcare towards 2030"
Because of rapid increasing interest of the specialist and advanced nurses’ role in European health, ESNO members has decided and based on advices of partners to change and broaden the original title of the ESNO congress 2019 and proceed on the this, including outcomes for the next three congress to come in 2021 and 2020 in Brussels and same location. 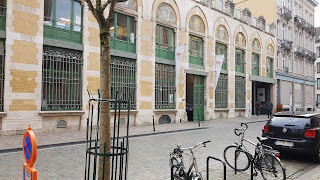 The morning focusses on setting the scene with discussions and debates with participants and the afternoon following this with input of ESNO members. With your participation you contribute to the future position, role and profession of your position in local, regional, national and European health context. Objective is to clarify the role of the Specialist Nurses in Healthcare 2030 by discussing their contribution and position to major health developments.